Life changing habits for success – Habit 4: Think Win-Win Win-win is a frame of mind that seeks mutual benefits in a relationship or deal. Win-lose : win-lose is the authoritarian approach: “I get my way; you don’t get yours.” Lose-lose : In this kind relationship both parties lose. Habit 6: Synergy. Synergy is the ideology that "two heads are better than one." Synergize is the habit of creative cooperation. It is teamwork, open-mindedness, and the adventure of finding new solutions to old problems. Habit 7: sharpen the saw Sharpen the Saw means preserving and enhancing the greatest asset you have--you. Habit 4 think when when. So when one is a frame of mind that seeks mutual benefits no relationship or deal. So take for instance one day you decide to buy a car and go to a car dealership. You find the car that you like until you approach the dealer. You start negotiating on a price and come to an agreement. And so you strike a deal. The cards in a mint condition and you're happy and pleased with it. 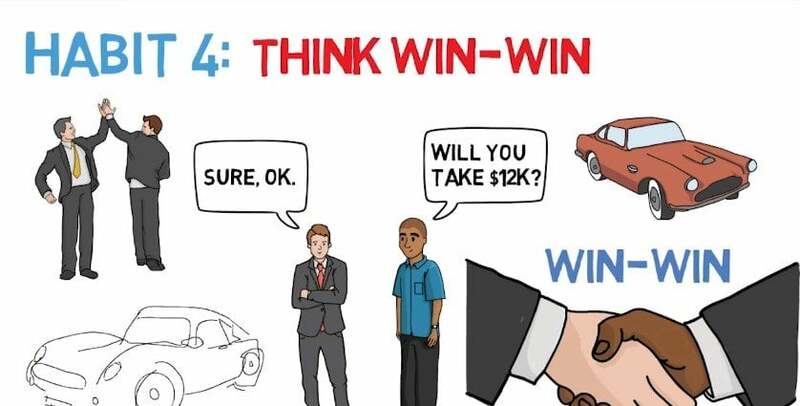 This is a win win relationship because you got the car at the price you wanted and the dealer in turn got the business win lose. So one alternative to win is a win lose. It says If I win you lose in leadership style when it loses the authoritarian approach I get my way. You don't necessarily get yours when people are prone to use their position powers credentials or their personality to get their way. So one day you decide that you need a brand new laptop. Right. And so you quickly browse through the Internet and find what you like. And so you place an order. So two days later a package has arrived finally and you're eager to start playing around with it. So as you begin to inbox your brand your laptop and begin to powered up nothing is happening your laptop is not turning on getting a little frustrated. But then you remember oh it's a brand new laptop. It doesn't have any charge so you charge it up and try again. But still the problem persists. The screen is black. The laptop is not turning on. What the hell is going on. Right. You're frustrated now then we begin to ponder. Wait did I just get rip off what's happening here. So you call the store and you tell the story after what can be described as being on hold for hours. Finally pick up and so they say I'm sorry sir but we're not responsible for any damages have incurred during the shipping of your product then they hung up in this constant short the story of one by selling the computer. But they also lost by losing each customer lose lose in this kind of relationship. Both parties lose. Take for example a guy called Ben who are a little situation going on. So one day Ben and a couple of his best friends decided to go clubbing. So in a club and his mate decided to have a little drinking challenge. So while under the influence of alcohol and heavy metal music band Izmit started doing all sorts of wild crazy stupid activities starting fights and breaking bottles causing all sorts of mayhem in the club. And to top it all off kissing strange women. Bearing in mind Ben has a girlfriend. So after watching this as quote unquote wild night Ben woke up to find himself in a jail cell and a text from his girlfriend Newling babe. It's over in less than 24 hours. Ben and his mates had done the unthinkable. They almost burned down a club which they don't remember. They got arrested and destroyed their relationship with the woman he thought he would one day marry. Now not only husband found himself on the wrong side of the law but he was also the woman of his dreams. This is a lose lose situation because Ben has lost the trust of his girlfriend and must now seek forgiveness that is if he wants to mend and restore trust. So go for Win-Win guys. Not only have to be sober and back but you also have to be confident. You have to be considered insensitive. You also have to be brave to do that to achieve that balance between courage and consideration is the essence of real maturity and is fundamental to winwin Habit 5 Seek first to understand then to be understood. If you're like most people you probably seek first to be understood right. You want to get your point across. And in doing so you may ignore the other person completely entirely pretending that you're listening selectively hearing only certain parts of the conversation or alternatively focusing on only the words being said but missed the whole meaning entirely. So why does this happen. Well because most people listen with the intent to reply not to understand you listen to yourself as a paper in your mind where you're going to see the questions you're going to ask. The long Trouville lecture is going to give you filter everything through real life experience. Your frame of reference. You check what you hear against your autobiography and see how it measures up and consequently you decide prematurely what the other person means before he or she even finishes communicating to seek first to understand. We must stop judging the other person looking at their situation through our own lenses. But when in fact they seek to understand and to advise accordingly. Habit Zik synergy synergy is the ideology that two heads are better than one. Synergy is the habit of creative collaboration. It's teamwork. It's open mindedness in the adventure of finding new solutions to old age. Problems but it doesn't just happen on its own. It's a process and through that process people bring all their personal experiences and expertise to the table together. They know they can produce far better results than they could have individually. It is the idea that the whole is greater than the sum of the parts that people cooperate in and begin to share and explore new ideas and allow themselves to be influenced by each other. They are enlightened and begin to see new insights and as a result old exponential fruits habits haven't sharpened the saw sharpen the saw means preserving and enhancing the greatest asset you have which is you. It means having a balanced program for self renewal and improvement in the four areas of your life your physical life your social life your mental life and your spiritual life your physical life to exercise on a regular basis and taking care of your body your social life making meaningful communication with others and hanging out with your friends your mental life learning reading and writing your spiritual life expanding a spiritual self through meditation and prayer. Martin Luther King once said I have so much to do today that I'll need to spend another hour on my knees. He saw a parent not as a mechanical obligation but rather a source of power. And with that said I'd like to end this video in the words of the Brooks and he said some days in the years to come you'll be wrestling with the greatest temptation or trembling under the greatest sorrow of your life. But the real struggle is here. It is now. Now it is being decided whether the deeds of supreme sorrow temptation you shall miserably fail or Lord.